Imagine rooms filled with cookies, cakes, chicken fingers, bread, pies, beer and pizza. Sounds like a food court, right? Even better, though, it’s all gluten free! This weekend I attended the Gluten Free Vendor Fair in Roswell, Georgia with David and my gluten-free buddy, Anne, and I got to sample (for free!) all of the gluten-free food I could ever imagine. Organized by the Atlanta Metro Celiacs and Jennifer Harris of the Examiner, this event brought in national and local businesses, that are all trying to offer us gluten-free eaters, more delicious food. While I felt a bit overwhelmed when I first walked into the Doubletree, I gradually made my way through the crowds (there were over 900 people in attendance!) and found many yummy, new foods to sample. What a great way to spend a morning, eating food (and not having to worry about contamination!) and talking to people who understand what gluten-free is and who are passionate about making it taste good. One of the highlights of the day for me was meeting Lee Tobin, the founder of Whole Foods’ Gluten Free Bakehouse. Lee was diagnosed with celiac in 1996 and has created a delicious line of baked goods; my personal favorites are the pie crust (which I sampled on Saturday with a mushroom quiche) and the apple pie. I thought I’d give you some of my personal favorites from the day. Now this list does not include everyone that I loved sampling. There wasn’t a bad taste in the place and even David enjoyed all of the food and he’s a gluten eater. 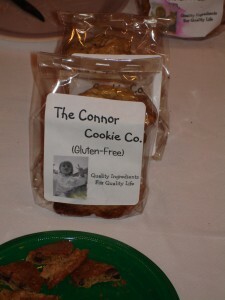 The owner of this company, June, bakes these absolutely delicious cookies because her granddaughter, Connor, has celiac. She makes brownies, chocolate chip and peanut butter cookies and they are so good. David says they’re some of the best cookies he’s ever had, including those with gluten! I bought a package of June’s chocolate chip cookies but it was a tough decision because the brownies and peanut butter cookies are so good too. You can freeze them also so you don’t feel like you need to eat them all at once. After all of the cookies I ate on Saturday morning, I did not think that I would be dying to buy more cookies, but June’s were just that good. The folks from the Roswell Outback came totally prepared for the Vendor Fair. This particular Outback has been incredibly supportive of the Atlanta Celiac Group and works hard to make their restaurant gluten-free friendly. The Outback crew made awesome “Our Buns are Gluten Free” (see above) t-shirts and were so enthusiastic. They had gluten-free bloomin’ onion samples, as well as gluten-free beer AND gluten-free doughnut balls. They don’t sell these doughnuts in their restaurant, but I hope they will soon. They were absolutely delicious. This restaurant in Raleigh, NC has made a delicious gluten-free pizza that they sell as a frozen pizza in stores. 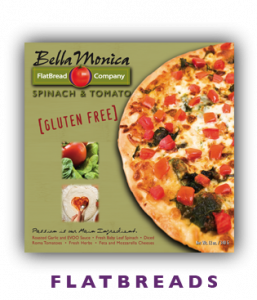 I could not believe that Bella Monica’s pizza was gluten free. I particularly enjoyed the mushroom, spinach and tomato pizza but the classic cheese pizza was delicious too. I talked to Bella Monica’s founder, Trevor Chambers, and he was enthusiastic about gluten-free eating and that we should be able to eat good food. Trevor has successfully made a pizza that does just that! It tastes like a restaurant pizza but you don’t have to go to a restaurant to find it. 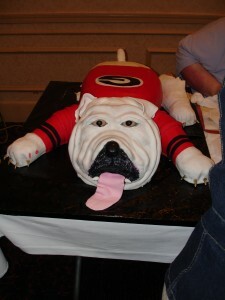 I must say that I was very impressed by this Chattanooga based bakery and the impressive cakes they had. A Bountiful Harvest was serving samples of their ‘Uga’ cake and even though I’m not a huge fondant fan, the cakes itself was absolutely yummy and so were their other icings. This would be a perfect place to order a cake for an event. They also have all kinds of cakes and pies as well and they use a dedicated gluten-free bakery, which I love! While these chicken fingers aren’t yet in stores, they were so good. Allergy Free Foods’ chicken fingers tasted fresh, crunchy and like a chicken tender you would get at a restaurant. Not soggy or mushy. I can’t wait until they start to have these chicken fingers in stores. These folks also serve all the allergy friendly food at Disney World. The people I talked to at their booth also were really committed to and passionate about making delicious, allergy-friendly food. Many of the products that were served at the GF Vendor Fair can be found at Return to Eden, which was one of the sponsors of the event. My only regret from the day is that I was so busy talking to vendors that I didn’t get the opportunity to talk to other celiacs like me. I hope everyone enjoyed the day and I would love to hear from people what their favorites were! Thanks to everyone who made the event happen. I recently went to Rosebud, a restaurant located in Morningside, just outside of Virginia Highlands. Rosebud describes its food as a ‘Creative fare of American cuisine with a bit of southern inspiration.” When a friend sent me a list of restaurants to choose from, I was particularly intrigued by Rosebud because of its mission to be an ambassador for local farmers and products. I’ve learned that when restaurants promote local fare, it means they’re creating fresh, flavorful food and Rosebud did just that! It also means that they’re aware of everything that goes into their meals, making it more likely that they’ll accommodate me, the gluten free diner. I met up with my friend, Allison, at Rosebud and even though I had already looked at the menu, I still had trouble deciding what to order because there were so many delicious items on the menu that seemed like great flavor combinations. I informed the waiter that I had celiac and he confidently assured me that I should be able to have most things on the menu, but most likely not the sauces that come with the entrees. He told me the chef could just make me a special sauce. That sounded great to me! As you know, I love it when a restaurant tells me to pick what I want and they’ll make it work. While I went with the lamb shank, there were definitely plenty of potential options for me at Rosebud. The crab and corn risotto and seared scallops also appealed to me. Allison ordered the shrimp and grits, which she said were delicious (and most likely GF but I didn’t ask). I highly recommend Rosebud and I will be going back! When we ate at Rosebud it was a Wednesday, which is known as Big Salad Wednesday. They have a special entrée salad menu on Wednesday nights. I was more interested in lamb shank that night but am eager to try one their beautiful, fresh, local salads. I also want to try the homemade pimento cheese…I’ll let you know if it’s gluten free. If you have not yet been to Legal Sea Foods, you must check it out. I ate lunch yesterday at their Atlanta location with Jennifer from The Examiner and I enjoyed every bite. (And I have lots of leftovers for lunch tomorrow!) Legal Sea Foods might be the most professionally I’ve ever seen gluten-free food produced at a restaurant. Legal Sea Foods has a nice gluten-free menu that is clearly written and organized. The wait staff and management were extremely helpful and friendly, making me feel very well looked after. I felt like I had a dialogue with our waiter about what to order, what was safe and how things were prepared. There were many highlights of the meal for me, but the best part was the fried calamari. Yes, I ordered gluten-free fried (and battered!) calamari. Legal Sea Foods has a dedicated gluten-free fryer so you can get any of the fried things on the menu. They use chickpea flour for the batter and it was delicious. There are many options on the gluten-free menu including clam chowder, many types of fish, crabmeat salad and filet mignon. Definitely something for everyone! They even have a gluten-free children’s menu. On the GF menu, they also list some things that do have gluten that you might think would be GF, such as their cocktail sauce and balsamic vinagarette. I felt comfortable and confident eating at Legal Sea Foods as everyone was knowledgeable and understand my needs as a gluten-free diner. It looks like pretty much all Legal Sea Foods’ locations have a gluten-free menu, so even if you’re not in Atlanta, hopefully you can find a location near you. It’s only 8:00 and I’m already thinking about my leftovers for lunch today! Check out Legal Sea Foods’ gluten-free menu. Last spring David and I came to Atlanta to check out the city, as we knew we’d be moving here this summer. While on this trip, I had the opportunity to check out a couple of different restaurants. As a huge fan of Bravo’s Top Chef, the place I was most eager to see was Flip Burger, which is owned by Richard Blais, a contestant on Season 4 and personal favorite of mine. For those of you who’ve seen the show, Richard always used molecular gastronomy in his cooking and has a bit of a mini-Mohawk. It’s clear from the name that this relatively new restaurant does burgers. They’ve got all kinds of burgers (turkey, faux lafel, salmon and lamb, to name a few) and they do them well. Before we went, our friends called ahead to see if Flip Burger was willing to accommodate gluten free customers and they said they definitely could. Located right on Howell Mill Road, Flip is in an up and coming area on the Westside and it is filled with customers. When we got to the restaurant we sat outside and could not have had a friendlier waiter. Enthusiastic and knowledgeable, she told me to pick what I wanted and they would see what they could do. I decided to go with the turkey burger which comes with avacado, alfalfa sprouts and pomegranate ketchup. The cook wrapped my burger in lettuce since I had to go sans bun. Definitely a thoughtful touch! We also decided to share the Caesar salad (without the croutons of course). Everything I ordered was delicious and looked beautiful. The presentation and menu creativity are some of the best parts of Flip besides the food. The highlight of the evening for me was actually getting to meet Richard Blais! Like I mentioned earlier, I loved him on Top Chef. He was friendly and nice to us and I thanked him for being willing to make gluten free burgers. He said of course they accommodate the GF customer and that he realizes what a large population is becoming gluten free. He even mentioned that on the side he’s working with a friend to try to create a delicious gluten free pasta. I’ll keep you posted if I hear anything more about that. Flip was a fun and unique first dining experience for me in Atlanta. I was definitely star struck but also enjoyed the delicious food. Many of the burgers themselves are gluten free (if you leave out the bun), but you might have to make some modifications to the toppings. Sadly you’ll need to avoid fried things (fries, onion rings, okra, etc.) but the salad was yummy and they have a beet and goat cheese salad that looks good too. The potato salad and five bean salad might also work, but I’ll have to check. The other component to Flip Burger’s menu are the liquid nitrate milkshakes. Full from my burger, I did not try or ask about the shakes. My guess would be that you need to stay away from the Krispy Kreme shake, but the others (Georgia peaches ‘n cream, foie grois, and spicy chocolate mole to name a few) are probably GF. If you go to Flip, and I suggest that you do, remind your server about being gluten free and also ask them to clean off the section of the grill/pan that they’re going to use to prepare your burger in order to avoid cross contamination.